What could possibly take the place of grass and still have all those great qualities associated with a lawn? Truthfully, the answer is nothing. There is no other plant that tolerates foot traffic the way grass does. There is also no other group of plants that requires so much tedious work and so much persistence to maintain. However, there is an alternative to lawn, especially if constant romping on it is not the goal. The choice hands down is a group of Ground Cover Oreganos. Not the kind of Oregano you put on your pizza, but the kind you walk on. These plants will grow in sun or partial shade. They will grow next to rocks and under trees. They only need to be mowed or sheared back once every two weeks in summer to maintain a tight to the ground appearance and not at all if you don't mind a little wilder look. They tolerate moderate foot traffic and are soft to walk on, gorgeous to look at and tough as nails. They even compete with weeds (but not grass) and after established almost eliminate the need for everyone's favorite job, weeding. I am so glad you asked! About a decade ago a group of Sage thinkers decided to plant a lawn with regular grass. It was a BIG lawn, approximately 6000 square feet. The ground was carefully prepared the sprinklers installed and just the right seed was chosen for the area. Cheery annuals were positioned around two LONG sides of the Emerald Isle and growing commenced. Weeds were minimal at first and the annuals and grass were splendid. The next year, of course, the annuals were gone and the weeds were starting to make themselves known. Did I mention this lawn is in the middle of native grasslands? Well, I'm sure you can guess the rest. Mother Nature had her way and her 'grass' became the borders predominant feature. Oh, don't get me wrong these Sage thinkers fought valiantly but to no avail. All those unruly weeds in the borders made the Big Emerald Isle looked like 5 Mile Island. SO... The borders were cleared and tilled. But before planting could begin, the weeds grew again and it was tilled again and again and again. A new idea began to form in the cerebral cavity of the Sage thinkers. So the GREAT experiment was started. They called on Yarrow and Chamomile, Oregano, Thyme, Ajuga and Wormwood. There was even a place for Coreopsis, Gailardia and Salvia. The ancient borders that had once been labor intensive annuals were dotted with these easy care perennials and left to fend for themselves. And, even though the beds had been carefully prepared, by Spring, Natures bounty (weeds) was, once again, taking up residence. In a last ditch effort to salvage the project and the perennials, the Sage thinkers started mowing the herbs every once in a while. What they discovered was amazing. Herbs are AGGRESSIVE. Cut them down and they come back with a vengence. There was no time for weeding these borders (and that would have interfered with the experiment anyway). The weeds that did sprout actually seemed to have helped the herbs get started by providing some shade in the hot, hot summer. This may be why lawns are good at covering the ground. Their little blades are so close together they protect the ground from drying out by shading each other. Unfortunately, all those little blades require lots of water and fertilizer and MOWING ALL THE TIME. There are two possible solutions for a better approach. Don't till, solarize. All that tilling disturbs the natural layers of structure of the soil and brings up seeds of weeds that have previously been asleep. If you are going to rip out an existing lawn, it is best to take the time to cook the ground before you replant with, well... anything. Applying a nice thick mulch when the plants are first planted will give your plants a chance to grow to their average size over the time they need to do so. If you need to mulch again the second spring, it will be over a much smaller area. 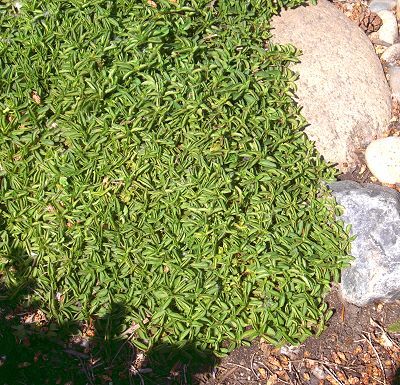 Once the creeping oreganos are established, the weeds won't be coming through. Closer spacing, putting the plants about 8 to 10 inches apart, instead of 12 to 18 inches apart, will cover the ground faster. This is nice if you are having a lawn bowling party soon and want to show off your new oregano lawn. So, the herbs passed the first challenge; if we did it right, they could compete with the weeds. BUT, SOME PROBLEMS CAME TO LIGHT AS SUMMER PROGRESSED. As soon as we mowed, we realized the coreopsis and salvia and other larger leafed plants were not good choices. Their big leaves were too choppy looking after they were buzzed. We left a few at the very back for color where the lawn mower just misses. By summer, two other challenges faced the Herbs, minimal water and bare feet. We could see chamomile and yarrow were not going to thrive with once a week watering only at 105 degree temperatures. They wilted a lot. They were not great for our barefoot test either. Yarrow is always making flowers and the little flower stems ARE sharp when mowed and we were not going to be pushed into mowing more than twice a month just to keep them from blooming. we found only three of our original group still worthy. The first, fringed wormwood, has proven the most drought resistant. It was planted at the edge farthest from the sprinklers and even with minimal moisture none died. But, we know from experience this plant will probably not look great in winter. I say probably because we have always allowed it to grow and flower and in the winter it gets the woody blues. Maybe if it were kept low and not allowed to flower it would be better. The thymes also tend to have the winter blahs and their stems were not the best for "barefootin" either. Plus, thymes are really better for smaller areas where their tendency to die back in spots is not as much of a problem. By now you've guessed where this is leading. Right back to our OREGANOS. There are three of these prostrate or creeping oregano gems: CREEPING OREGANO (Origanum vulgare humile, formerly, Origanum compactum nanum) is a brilliant green; CREEPING GOLDEN MARJORAM, (Origanum vulgare aureum) is a golden green in spring and fall and dark green in summer; and MOUNDING MARJORAM (Origanum marjorana 'Betty Rollins'), pictured below, which is a darker green with a hint of red, a wonderful minty fragrance and a small pink flower stalk. Most exciting is the lack of labor and precision these plants require. Don't feel like mowing this week? Skip it. In fact, they could be left for a once a year shearing. They will not look woody after and the scalped look should disappear in two to three weeks. However, mowing twice a month during the growing season keeps the "lawn look" going and satisfies those who want flat green and neat.